Choose a secure password; Strong Password Generator and DinoPass are easy to use password generators. Teacher accounts have access to confidential data; don't be the weak link. 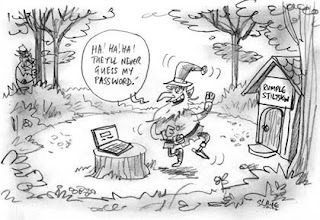 Passwords are private. No sharing with friends or classmates. Keep written passwords secure; avoid post-its on the monitor, never write on the board. Do not say passwords out loud. Learn to type your username and password quickly. Always logoff shared computers; lock personal computers when not in use.